We live next o the Maitai river so it’s part of our daily life. One fine summer day we had a family picnic including our 2 dogs and the kayak. The big brown one , the big bull mastiff in the kayak does not like the water. In fact watching him attempting to swim or more stay above water was just hilarious. The other one was a very very intelligent lab/ border collie cross. 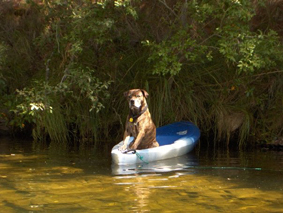 while playing around with the kayak the kids managed to get Boris on it with them. They hopped of and watched him float to the other side of the river. Whimpering he got our attention but refused to jump out and swim back. But trusty Nyonya came to the rescue. We coached her to swim over, grab the rope with her mouth and pull Boris back to us. No easy task when your mate weighs 45 kg. Sadly both are no longer with us but the memory lives on. Both our new dogs have big shoes to fill.